Eight Alberta-based non-profits and industry associations have recently been awarded government grants to enhance the clean technology sector. Government funding will enable the organizations to develop new technologies, establish startup working space, and better market technology-based solutions to potential purchasers. Through the Western Diversification Program, a total of $3,485,406 will be divided among successful applicants. By contributing Canadian government grants to clean technology (cleantech) organizations, the federal government is helping fight climate change while diversifying the economy in Western Canada. These investments will lead to new opportunities for cleantech developers and improve their ability to bring innovative products and services to market. During the Western Diversification Program’s 2017 Call for Proposals (CFP), the federal government identified two focus areas of funding support. These included investments for (1) clean technology and/or (2) Indigenous economic growth. Alberta Clean Technology Industry Alliance ($190,000): Promoting Western Canada as a global cleantech destination through industry-focused events in 2017-2019, fostering enhanced access to services and programs, and activating international opportunities. Canadian Global Exploration Forum ($70,906): Showcasing Western Canadian clean technology innovators at multiple events, including the Global Petroleum Show, CGEF’s 2017 annual conference, and the 2018 Global Petroleum Show. CapitalRoad Foundation ($228,000): Hosting cleantech events including the Canadian Financing Forum, the Banff Venture Forum and PROPEL Energy Tech Forum from 2018 to 2020. CMC Research Institutes Inc. ($974,000): Developing state-of-the-art technology for methane emissions monitoring which improves emission detection accuracy. TECTERRA Inc. ($915,00): Investing in new equipment to help companies develop, test and commercialize clean geospatial technologies. University of Calgary #1 ($400,000): Establishing a Centre for Smart Emissions Sensing Technologies which supports development of smart technologies to quantify methane emissions in the oil and gas sector. University of Calgary #2 ($314,000): Creating an outdoor validation facility to demonstrate innovative solar bio-technologies that produce renewable gas, plastic and electricity. Petroleum Technology Alliance Canada ($393,000): Building a Centre for the Demonstration of Emissions Reductions (CeDER), which is mobile and will field-test methane emissions reduction technologies. The Western Diversification Program (WDP) is a Canadian government funding program administered to non-profits and industry associations operating in Alberta, British Columbia, Manitoba and Saskatchewan. The fund offers an annual Call for Proposals where new priorities are set and identify economic sectors being supported. Through the Western Diversification Program, eligible applicants may offset a portion of costs related to economic development and industry support activities. To apply for Western Diversification Program funding, potential applicants must wait for a Call for Proposal and ensure that they meet the investment priorities of that particular intake. 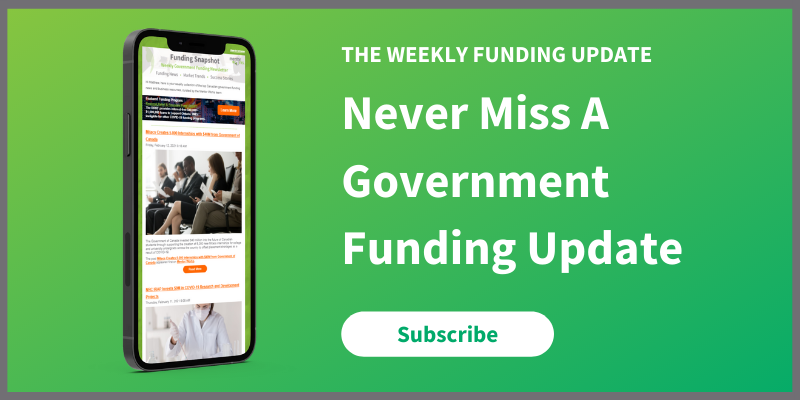 To learn when a new Call for Proposals has been announced, please register for the weekly Funding Snapshot™ newsletter.